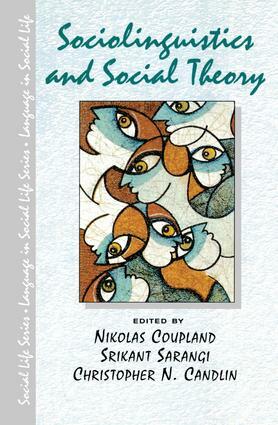 In substantial introductory and concluding chapters, the editors and invited discussants reassess the boundaries of sociolinguistic theory and the priorities of sociolinguistic methods. Sociolinguistics and Social Theory encourages students and researchers of sociolinguistics to be more reflexively aware and critical of the social bases of their analyses and invites a reasessment of the place sociolinguistics occupies in the social sciences generally. Nikolas Coupland is Professor and Director of the Centre for Language and Communication Research, Cardiff University. Srikant Sarangi is Reader in Language and Communication at the Centre for Language and Communication Research, Cardiff University, and Christopher N. Candlin is Chair Professor of Applied Linguistics and Director of the Centre for English Language Education and Communication Research, City University of Hong Kong.